This is a continuation of my series of posts about inspirations for my campaign world, the World of Samoth. Other posts in the series have discussed the role of Earth History, and also the World of Conan. After the countries visited by Conan, probably no other fictional source had a greater bearing on what the World of Samoth was to become other than the "Known World" as first depicted in Module X1: Isle of Dread. Note that I refuse to call it "Mystara" - I never liked that name, and it was one that was slapped onto the world years after I first learned of it. To me, it will always be the Known World. The Known World is sort of what I refer to as "Conan Light." That is to say, it borrows from Robert E. Howard's technique of picking different points of interesting Earth history and cultures and intermingling them all into a massive, cohesive fantasy stew. So, in the Known World, you've got Scandinavian types up in the Soderfjord Jarldoms, and then just to the South of them, on the other side of big mountain range, you've got a desert and then the Emirate of Ylaruam, a super religious Arabic-flavored country, which is next to the Byzantine-like Empire of Thyatis. There's also an Italian merchant republic called Darokin, the Mongol-like Ethengar Khanate, Mughal-era India-like Sind, areas for the Dwaves (Rockhome), Elves (Alfheiim), Halflings (the Five Shires), wizards (Alphatia)... the list goes on and on. I love this kind of stuff - having fantasy countries based on different eras of human history, all co-existing simultaneously, if one of the main things I set out to do with my own campaign world. When I say "Conan Light", what I mean is that the Known World just seems a little less... savage, than the world of Conan. There's a darkness to Hyboria that's partly due to the pulp-nature of the stories, and I miss that in the Known World. There's something a little too "corporate" or "marketing-based" behind the Known World. It's difficult to describe, but as you read it as originally described in the Isle of Dread, you can tell that it must have had to go through a few rounds of the corporate police before it was considered "safe for young adult consumption." The Known World also suffers from not having an internal consistency that Conan's Hyboria has. What I mean by that is, in Howard's Conan writings, we understand that we're reading a version of pre-recorded Earth history. It's Earth before the sinking of Atlantis and the development of the modern nations as we know them now... but it is still Earth. So, the cultures and countries have an internal consistency to them. Zingara is roughly where we think Spain would be. Argos is roughly where we'd expect to find Greece. The Known World, on the other hand, does not have this kind of internal consistency to it. It was built from the ground up as a generic fantasy world for the D&D Basic/Expert game - a world that could be used as a backdrop for the adventures modules produced for that game line, and one that wouldn't be as "adult" and complex as Greyhawk. But, its greatest strength - its basis on real Earth cultures - is also its greatest failing. Because many of the countries in the Known World are based on Earth counterpart, there is a disconnect when we find, for example, a plain of horse-riding Mongol archetypes right next to a Germanic-type country ruled by faux-Teutonic Knights. However, that's a minor quibble and one that I usually just overlooked, because I never actually used the Known World in any of my campaigns "as is." I basically looked at the material as fodder for many of my proto-Samoth campaign worlds, especially when I wanted to include a culture based on one of the ones in the Known World. It was so much easier to do that than it was to trek to the library and read through a long Encyclopedia entry on "Mongols of the Medieval Era" or whatever. Although the Known World started out as just a few pages of description, listing just a few lines for each of more than a dozen nations, it vastly grew over time. Many new modules added to the complexity of the world, such as the further development of Sind in the "Master of the Desert Nomads" series of modules, which James Maliszewski recently wrote about on his blog. Oddly enough, this Indian equivalent was the only Asian culture that made its way into the Known World. Like so many other campaign settings before and after it (Greyhawk, pre-Oriental Adventures Forgotten Realms, Dragonlance) there were no equivalents of China, Japan, Korea, et al. I've never really been sure why that is, but that's a topic for another blog post. Although nowadays, I can appreciate the somewhat sparse, DIY approach to the original Known World, there were two developments made to the world much later on that I enjoyed immensely. 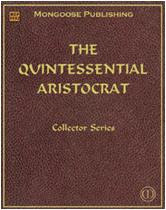 The first was the Gazetteer series, published in the late 80s and early 90s. There was one Gazetteer for each country, and each provided a wealth of material regarding the history, politics, culture, economics, relations with other countries, naming practices, attitudes toward magic and religion, and all sorts of other interesting facts. Once again, I never used these in my games directly, but used them for ideas for my own campaign world. And, honestly, it's actually probably way too much detail, because the average DM or player is never going to use the majority of this information in their campaigns, but it did make the world seem so much more "alive" to me. The second was a long-running series by Bruce Heard in Dragon magazine called "The Voyage of the Princess Ark." It ran, if memory serves, roughly around the 150s through the late 190s or early 200s of Dragon and detailed a sky-ship and her crew sailing across the continent and detailing the strange and exotic cultures they met on their travels. It was what the kids today call mostly "fluff", with only scant game mechanics once in a while to detail a new monster, race, or magic item. And even though I wasn't playing the Known World, I loved those articles. They're so creative and full of ideas and inspiration far beyond what the Tolkien-clone AD&D game worlds were doing at the time. And I think that's probably one of the Known World's best legacies. As James over at Grognardia pointed out quite a while ago, the fact that the B/X D&D line was pretty much being ignored by the suits at TSR at the time meant that the game developers who took it under their wing could come up with really creative stuff that pushed the boundaries of what we typically think of when we think "fantasy." My World of Samoth thanks them for that. Anyone else here love the Known World as much as me? What were your experiences? Back in the day the Known World was my world. When I went to high school my new DM was using Greyhawk so we merged our worlds into one larger one. Many years later I found a map drawn by chatdemon that was very close to what we had done. I liked those Princess Ark articles in Dragon a lot back in the day. But I was so indoctrinated into AD&D that I really didn't know what to make of the D&D products at the time. Since then, I've considered the Known World from time to time as a campaign world for a game. Hey, didn't that Red Steel setting for AD&D use the Savage Coast from the Known World? 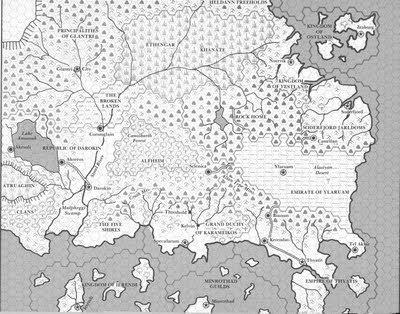 I never played in the setting, nor did I read any of the gazetteers, but I did own the Rules Cyclopedia, which had some maps from the Known World in the back, and they were always fascinating, as they revealed an expansive setting that wasn't one of the big boxed ones with which I was more familiar. @Tim - thanks so much for commenting! I checked out your first link (the "absolutely" one) and that is just awesome. I'm looking forward to taking some time over the next few days to read more about your Mystoerth world. Have you actually used it in your games? It sounds really cool. @Drance - Yes, Red Steel was part of the Savage Coast, which was largely the area described in the "Princess Ark" series. Oddly enough, my FLGS has a shrink-wrapped Red Steel box set sitting in their used section. It's been there for at least a year. I've often toyed with buying it (I think it's like $10 or $15), but I do have to watch my money and more importantly, my space. 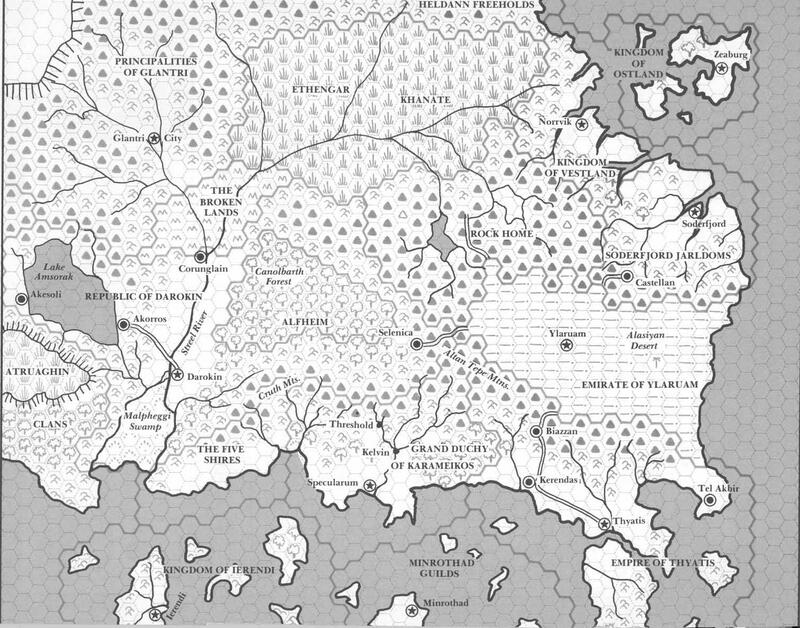 @Kelvin - The Gazetteers were some of the best products that TSR put out during that period, in my opinion. I never got the Rules Cyclopedia - I'm curious how the map for the Known World in that book differs from the one I posted above, which is out of X1. Music & Monsters, or "What Do Gamers Listen To?"